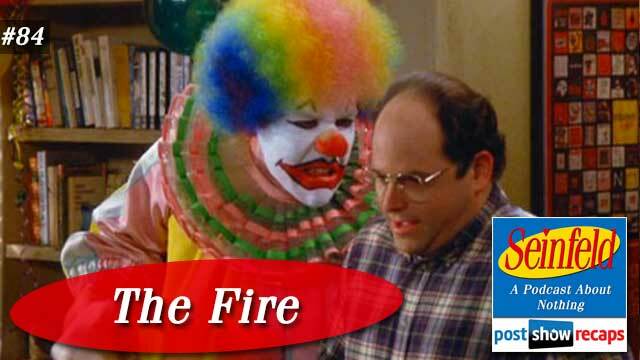 Rob Cesternino and Akiva Wienerkur couldn’t get Eric the Clown to guest on the Seinfeld podcast this week, but they trudged along anyway with their recap of “The Fire”, which first aired May 5, 1994. The episode was written by Larry Charles, who Akiva thought had his best episode to date. There was no Seinfeld news this week, but Akiva offered the listeners a can’t miss recommendation in a new Netflix show, Making a Murder. He likened it to the podcast Serial, though he thinks it will be even better. Jerry is having a writer from Entertainment Weekly review one of his sets, so he invites George and Kramer to bring along their new girlfriends for support. Kramer and his girlfriend Toby come to the show, and Toby inexplicably interrupts the show, going as far as heckling Jerry for telling a joke about women. The Entertainment Weekly article ends up highlighting this bombed set in the article, causing a gig in Miami to be cancelled due to the bad press. When he tells George about this, George recommends Jerry go to her work and heckle her, for the ultimate comedian’s revenge. The plan goes awry when Toby gets upset and runs out of the office, only to have her pinky toe severed by a street sweeper. Elaine had a small part to this episode. Her colleague Toby, who is dating Kramer, is interested in a senior editor position that Elaine is also interested in. She eventually loses the job to Toby, since their boss felt bad for Toby after having her foot run over. George’s storyline is one of the greatest in the whole series. His new girlfriend Robin’s son is having a birthday party, and when the stove catches fire, he barrels over every woman, child and clown in an effort to save himself. When called out on this, he makes up several elaborate lies about how he was acting fast as the leader saving everyone, though no one buys it. After hearing Kramer’s heroic story, George feels compelled to make up for his cowardly ways, but it goes poorly at the end of the episode. Ronnie the prop comic is holding up a fake gun, and George clears out the club by yelling about the gun, ruining Jerry’s opportunity to show the Entertainment Weekly writer a good set. Kramer is dating an obnoxious woman from Elaine’s office named Toby, who is helping him move forward with his coffee table book. After he brings her to Jerry’s show and she ruins it, he spends much of his time defending her. After Jerry causes Toby to have her toe run over from a street sweeper, Kramer finds the toe on the street and hops a bus to rush it to Toby at the hospital. While on the bus, he apprehends a hijacker, takes over driving the bus when the driver passes out, and successfully delivers the toe to Toby, where it’s successfully reattached. Akiva and Rob had several great tangents, as usual. First they debated whether the birthday for a baby or an elderly person is easier to attend, ultimately deciding the baby’s birthday is better. Next they discussed how the prizes won on The Price is Right end up costing the winner a great deal in taxes. The guys wondered whether a random comic today would get heckled for a bit about women being nesters.They also compared how Eric the Clown not knowing Bozo was like Rob not knowing Marc Maron or Richard Hatch. Lastly they debated how the pinky toe is the most useless appendage, but Akiva thought the appendix is more useless than that. In 2015, Akiva thought nobody would take a bus, and couldn’t rob it since everyone has metro cards. Also, EW is not covering a comedy show. Lastly, he thought that you should never invite more than four little kids to a birthday party. In ranking the episode, Akiva was thrilled with it, so he put it at 20, though Rob felt quite differently, thinking it should be ranked in the 90s somewhere. The guys were especially happy with each of the storylines this week. Both thought Kramer knocked it out of the park with his hijacker monologue, earning an A. Elaine, though not a big part of the episode, was feisty and funny, so Akiva gave her an A, but Rob knocked her down to a B- because her scenes with Toby weren’t too great. Jerry gets a B from Akiva and a C+ from Rob, since both were a little down on his involvement. George had an all time episode with the fire scene, so Akiva gave him an A, and Rob gave him an A+. There were a few emails this week. First, Craig suggested Akiva go see the new Star Wars movie and write a review about it, but Akiva held strong in his quest to never see any of the franchise. He also asked why everyone didn’t get off the bus when Kramer would stop to get away from the gunman. Travis emailed to point out how this episode had great monologues, and thought Akiva would rank it in the upper echelon. Rob was impressed that he hit the nail on the head. Amir said he was surprised that George would date a single mom when in the last episode he did all he could to avoid mentoring a boy for the big brother program. He also noted that the coffee table book could really be a good seller, though it probably didn’t and wouldn’t take off according to Rob and Akiva. Lastly he remarked how these monologues really show the talent of the core four actors. Chester ended the email segment by asking if it was canon for George to not blow out the candles because he has asthma. Akiva confirmed that Jason Alexander actually does have asthma. He also wondered who was the random old lady at the birthday party, to which Akiva thought it was probably a great aunt, or the like. Lastly, Chester challenged how the piggy toe should not be important, based on the song that has it just going “wee wee wee all the way home”. Tune in next week as the guys will recap “The Hamptons” where the term “shrinkage” is first introduced in pop culture. Send in your questions by emailing [email protected]ps.com. 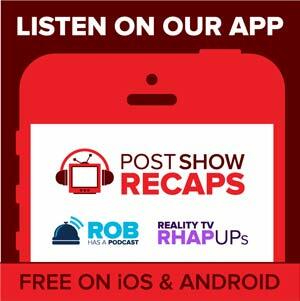 Don’t forget to subscribe to the podcast by going to postshowrecaps.com/ seinfeldITunes where you can rate and review the podcast. You can get a discussion going about the podcast by leaving a comment on the show page, and as always, you can follow them on Twitter @robcesternino and @keev26.